During November, the weather starts cooling down. People pull out their pants, boots, and heavy shirts. And it seems that guys start sporting more facial hair. Well this isn’t just a coincidence. 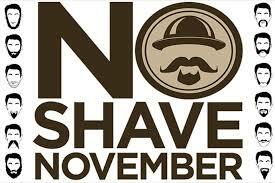 During November, there are two initiatives that take place: No Shave November and Movember. No Shave November is “a month-long journey during which participants forgo shaving and grooming in order to evoke conversation and raise cancer awareness.” “Grooming and trimming are perfectly acceptable”. But for the most part you are to grow out your facial hair for 30 days. Their mission is “growing cancer awareness and raising funds to support cancer prevention, research, and education.” They donate 80% or more of the funds they receive to the American Cancer Society, Prevent Cancer Foundation, Fight Colorectal Cancer, and St. Jude Children’s Research Hospital. The Movember Foundation is about raising awareness for men’s health issues like prostate cancer, testicular cancer, poor mental health, and physical inactivity. During November, you can grow a mustache in support of the cause, as well as donate. The foundation started in Australia back in 2003 and is now in 21 countries. Whether you want to grow out your beard, mustache, leg hair, or anything else, it’s important to remember the reason behind it. Sure, growing out a beard is fun and definitely in style nowadays. But it’s important to participate to raise awareness and know why you’re participating. Get your friends involved and make it a group event! Help spread awareness of these issues during November, and the rest of the year.